When you use some digital cameras that are full of mov files and stop you to edit with Windows Movie Maker, a MOV to AVI Converter is a good way to solve this problem and makes you easily edit or convert MOV to AVI files that can be compatible with many players like Creative and Archos. Here we would like to introduce you a powerful and world's fastest converter , WinAVI All In One Converter, also a QuickTime MOV to AVI converter that can convert mov format with high quality and super faster conversion speed. 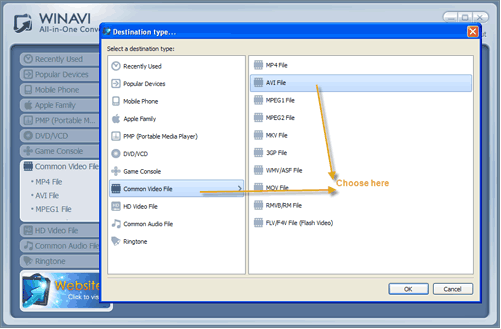 Below is the guides on how to convert MOV to AVI file with WinAVI MOV to AVI Converter. Step1: Free download WinAVI All-In-One Converter - the MOV to AVI Converter, then install and run it. Step2: Click "Add files "button to upload MOV file from your computer or directly drag the into the program directly. Then you choose "Common Video File" and then select " AVI File" on the pop-up window. Step3: Click "Advanced" to customize AVI file output. Step4: Click "Start" to begin MOV to AVI conversion. 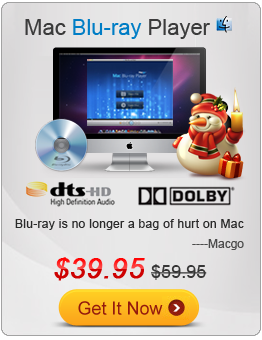 Attention: Please note that the free version has a transparent company logo in the background. The watermark will disappear after buying. You can ignore it and keep going on. 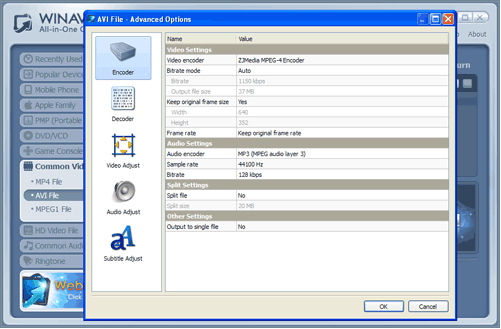 When MOV to AVI conversion is completed, you can click "open output directory" to access the converted AVI videos directly.